It's a shame, as I really enjoy birding. It just I enjoy other things slightly more at the moment. Things will change though. I have a weekend in Finland soon that I plan to spend wandering around places with better birds than here, and I have a long weekend at Falsterbo over migration. That, I am told, is superb birding, and I can't wait. I am also half considering booking up Shetland this October. More precisely I am considering gate-crashing some mates that are going. Shetland is proper birding. It separates the wheat from the chaff, and you have to properly go at it. I love it (for a few days), and when it really kicks off it's one of the best things ever. When it's dead, you revert to drinking. Win win. Last year I found an OBP. Imagine that! Instinct kicked in, I knew I had something, I knew it was good, but I hadn't seen it well, it hadn't called, and didn't know what it was. The feeling was totally awesome. The point being that is it about time I eased myself back towards birding a little. It's been a tough year, I've done a lot, but the pendulum has swung a little too far off course. Once a week round the patch, especially as it becomes interesting again. Why not? The upside to rampant twitching is that I need never worry about certain birds again. When a Semipalmated Plover appears somewhere I'm not going to give two hoots. When a Snowy Owl arrives on a distant Hebridean Island, not even one. Great Knot, no interest. Brunnich's Guillemot in Thurso harbour, not for me. The odds are moving in my favour. Sure I'll miss a few, I always do, but if I'm away when the big one breaks, it won't be a big deal. And despite my hectic schedule, I seem to do OK. Pretty good even some might say. The Yellow-rumped Warbler early on, followed by a mammoth weekend of a trio of (boring) Yanks in Scotland. And then Spectacled Warbler, Short-toed Eagle, Great Knot and Ross's Gull in the summer that kept on giving. A tidy haul indeed, especially as I was out of the country when three of the final four broke. Best bird so far? Either the rogue Caper in Scotland, or the Long-tailed Skua just recently. 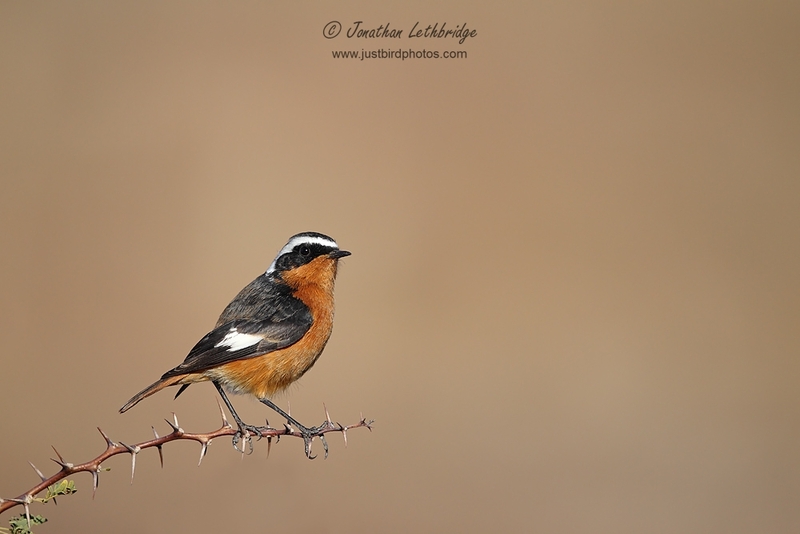 Or that really friendly Shrike in Morocco. Or perhaps the Pied Wheatear in Cyprus (mmmm, Wheatear). Or maybe the......Whichever, I just love birds. Nice shot of my fave Maroc bird. Jono, the hate bit is nothing to do with bins or cameras! Have you thought of putting a Barn Owl box up on your patch Jono? Dave.